Given the emphasis on the shape and form of individual plants in the Oriental gardening tradition, it is perhaps not surprising that the creator of these works is South Korean. 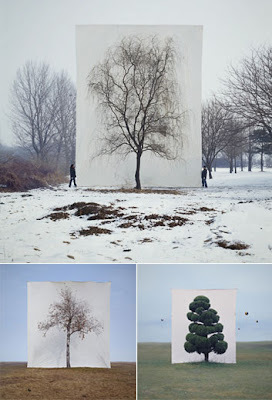 Photographer Myoung Ho Lee "makes us look at a tree in its natural surroundings, but separates the tree artificially from nature by presenting it on an immense white ground, as one would see a painting or photograph on a billboard." Quote from lens culture, where you can find more information and prints available for purchase. The goal of Myoung's work is to make a photograph rather than to intervene in the landscape like Christo and Jeanne-Claude, whose work seems an obvious inspiration. But I'd like to think that these backgrounds are still out there, that somewhere in some forest I might come upon a tree shivering against a background of white, ready for its close-up. Beautiful blog. I have immensely enjoyed looking at your photos from China! I never realized the importance of the negative focal point in creating the serene Asian look, it seems strangely lacking in Western gardens. I'll be looking forward to more great photos. 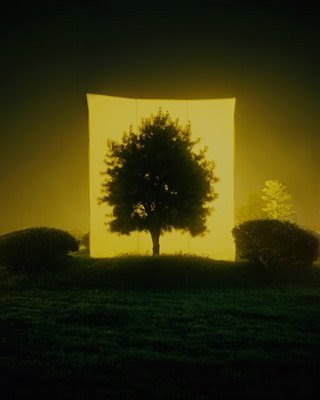 Beautiful work that heightens looking just at a single tree. I think of the white fashion-inspired backdrops of so many Richard Avedon photos, and think that the idea of "objectifying" the natural world is an interesting one.